One of the great Lou Gehrig cards, you have to love this image with Gehrigs hat turned up! Historically these have traded for several times the price of his 1933 Goudey cards, we feel the market is too low on this right now. The offered card has exceptionally rich color, perfect image clarity and clean surfaces. The borders look good, the corners are in the VG to VG-Ex range, centering is to the left border. There are no visible creases or wrinkles even under magnification, this classic card is really much more like a 4 or 3.5 than 3, PSA graded this onsite at last years National and may have been a bit harsh. 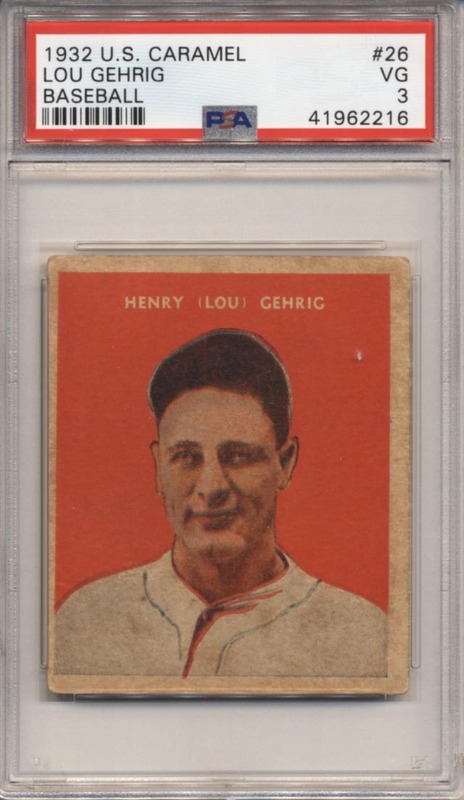 Either way, this is a classic card of Lou Gehrig that has tremendous eye appeal and seldom comes up for auction.